Our trick-or-treaters’ Halloween sacks are overflowing with candy and isn’t it an unwritten rule that your kid’s goodies are also yours to enjoy? We think so! Forget all that colorful, fruity, super sugary stuff. Ain’t nobody got time for that! Bring on ALL the chocolate! Good thing for us our kids have plenty to share to make our Candy Bar Trifle our best leftover Halloween candy idea yet! Make the cake according to the directions on the back of the box. Allow to cool. Once cool, line the bottom of a trifle dish or mason jar with scooped out pieces of the cake. Spread a layer of whipped cream on top and top with candy bars. Add more cake to the top. 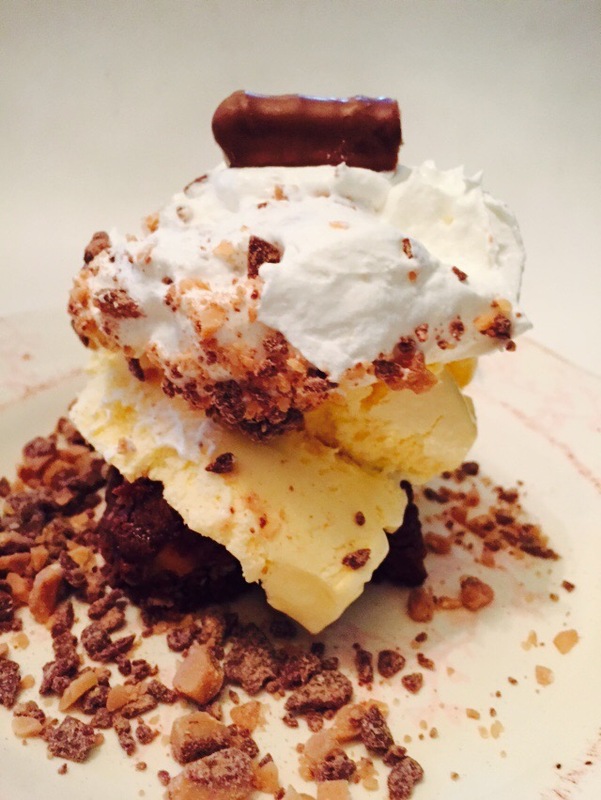 Top with more whipped cream and more candy bars. Keep layering until you get to the top of your trifle. With all the WANTS this time of year we feel it is a MUST for ourselves , as well as our kids, to give back to those in NEED. We’re giving back in service, resources, and time. So, when our church asked for cookies to be donated we strapped on our aprons, gathered supplies, and baked with happy hearts. 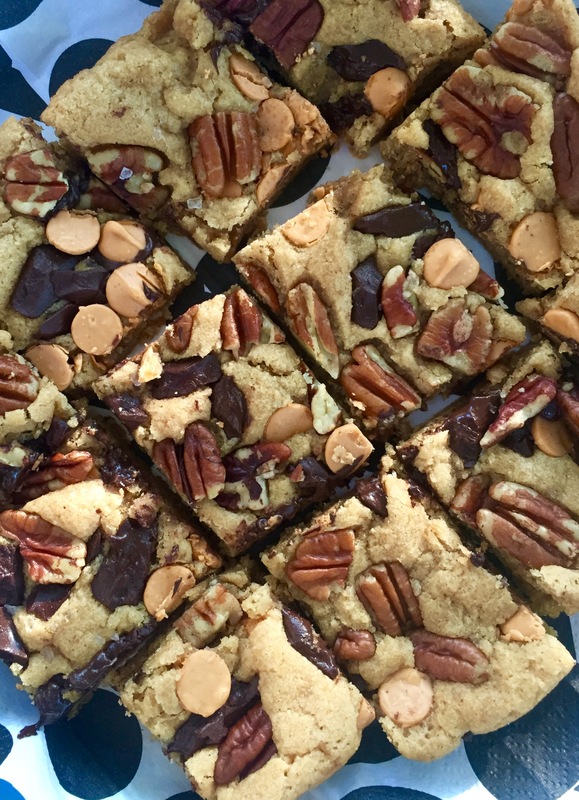 We’re hoping our Caramel Stuffed Brownie Cookies bring smiles to many faces. It truly is better to give than receive! 1	Preheat oven to 350 degrees. Line baking sheets with parchment paper. 2	Combine brownie mix, flour, oil, eggs and water in a large mixing bowl. Mix with a wooden spoon until well blended. Cover and refrigerate dough for 1 hour. 3	Shape about 1 tablespoon of dough around 1 chocolate. Roll the dough in powdered sugar to coat well. 4	Place on prepared baking sheets and bake until cracked on top, about 10 minutes. Let cool for 2 minutes on baking sheets. Remove to wire racks to cool completely. Ready or NOT, here we go into another school year! This means early morning alarms, chauffeuring kids to and fro, and (the dreaded) homework! Thinking of this has us longing for the easy, breezy days of summer. We’re gonna need plenty of energy to make it through these first few weeks! The best way to battle this head on is with a fully leaded espresso. And even better when it’s smothered with chocolate and caramel! 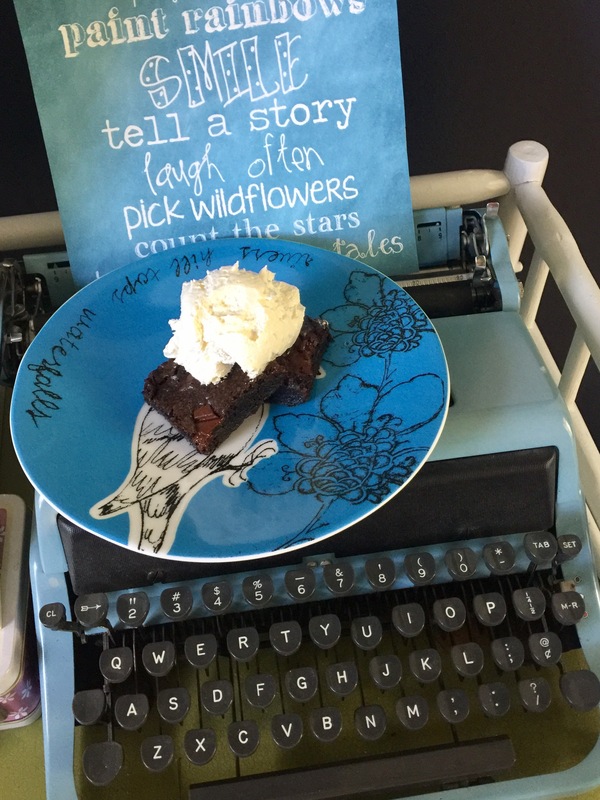 Salted Caramel Espresso Brownies will sure help us weather the storm we’re about to endure! Make the brownie batter according to the directions on the back of the box. Stir Vis into the batter. Pour half if the batter into a prepared pan. Break the candy into pieces and lay in top of the batter. Pour the remaining brownie batter on top of the caramel pieces. Bake for 25 min. (We recommend undertaking!) Eat when cool and get stuff done! This weekend marks the unofficial end of summer, but we started Fall a little early and took our troops apple picking. 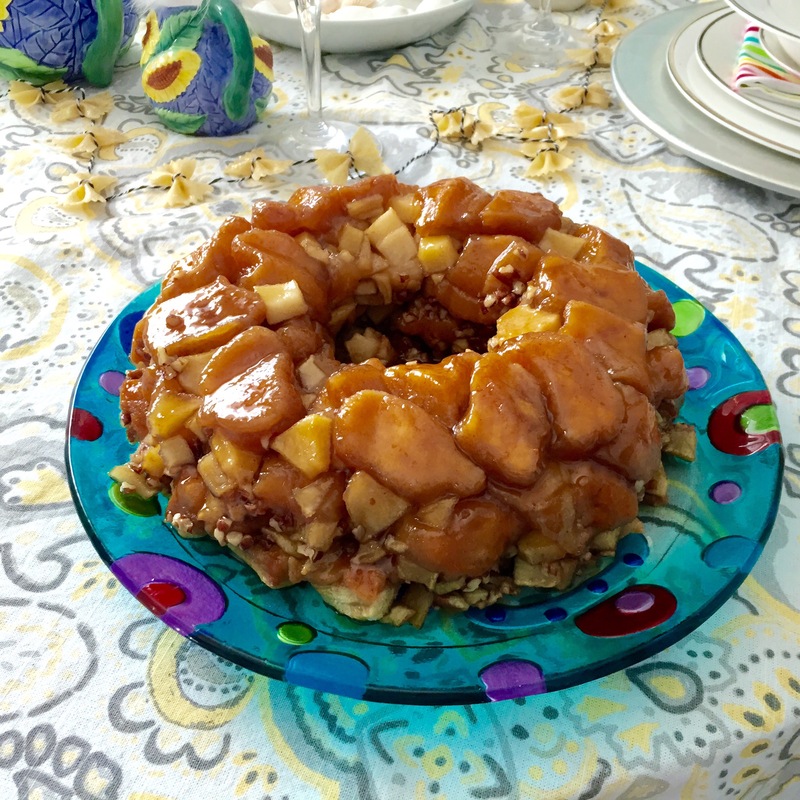 Our rascals swung from tree to tree looking for the sweetest, juiciest ingredient for this Saturday’s Caramel Apple Monkey Bread. We had more fun than a barrel of monkeys and ended up with a treat worthy of going Apple! Happy Labor Day weekend! Preheat the oven to 350°F. Grease a bundt pan with cooking spray. In a medium bowl, stir together the sugar and cinnamon. Set aside. Separate the dough into 16 biscuits then cut each biscuit into quarters. Add each piece of dough to the bowl with the cinnamon and sugar, tossing it to coat it on all sides. Layer the coated dough pieces with the diced apples in the prepared bundt pan. In a small bowl or liquid measuring cup, mix together the brown sugar, melted butter, Heath, and pecans. Pour the mixture evenly on top of the dough. Bake the monkey bread for 28 to 32 minutes until it is no longer doughy in the center. Remove the bread from the oven and allow it to cool for 5 minutes in the pan before placing a serving plate on top of the pan and flipping it upside down. Serve the bread immediately. It’s Memorial Day weekend and you know what that means- Party Time! Cue the music, grab the bathing suits, and don’t forget the picnic basket. If your cookout looks like ours’ it’s quite treat heavy! Who needs burgers, potato salad, and chips? Not us! Ain’t nobody got time for that! Bring on the desserts! 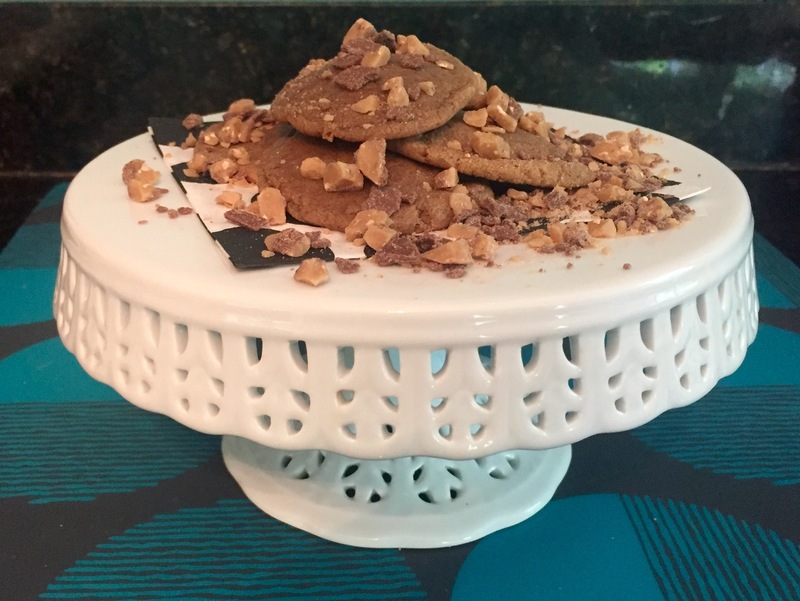 We’ll be filling our plates with lots of goodies like Supreme Cookie Butter Cookies, Salty and Sweet Butterscotch Blondies, and Twix Brownies. What’s on your holiday menu this year?